Made especially for the Traser Big Date Alarm in traditional stainless steel. This watchband is NOT BLACK and NOT PVD Plated. 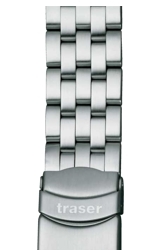 This solid stainless steel band has a fold-over, double locking clasp. The end piece is 22 milllimeters.